Capri Island is surrounded by shimmering seas and boasts some of the world’s most beautiful natural formations. As a historic home for some of the world’s wealthiest rulers, Capri is filled with lavish buildings perched on cliffs overlooking the paradise below. Enjoy a holiday spent hiking on winding trails, sunbathing on beautiful beaches and indulging in gourmet food on suntrap terraces. Capri Island is a pedestrianised island off the coast of Italy, which has two major towns, Capri and Anacapri. You will find plenty of places to holiday across the island, though it is worth remembering that Capri town is best-known for its bustling nightlife while Anacapri is known for its earthiness and tranquillity. Capri holidays are best known for their perfect beaches so you can look forward for taking a dip in the sea or watching the sunset. Head to the largest beach, Marina Grande, for blue water that is both clean and calm. If you’ve got kids in tow, the smaller Palazzo a Mare beach has a tiny cove to keep them splashing happily. Take your camera to the beach at Marina Piccola to capture the nearby Faraglioni, a trio of rock formations. For a bit of history, visit the ancient ruins on Capri Island, including those of the villas of Roman Emperor Tiberius. He built 12 villas in total on the island, including Villa Jovis, now a site of well-preserved ruins at the end of a thrilling uphill climb. Pack a picnic and head to another of his villas, Villa Damecuta, to see the Damecuta archaeological park and the surrounding vegetation. Hiking is a popular activity on Capri Island, so strap n your boots and follow the winding trails through beautifully manicured gardens and past rugged cliffs. Via Krupp, a steep path cut into the cliff face, is a must if you’re looking for a bit of adventure. Whether you visit Capri Island for an extended holiday or on a day trip from a nearby town, you will be enchanted by its sweeping views and natural beauty. Italy is a great location for a beach holiday. If you like beach holidays in Capri then you're sure to love our all inclusive holidays to Capri Island, cheap beach holidays to Sorrento or our Taormina beach holidays. Book with Expedia and find out why for yourself. The Mediterranean limestone island of Capri has been visited through the ages by intellectuals, artists and writers charmed by its enchanting beauty. A holiday in Capri is a blend of history, nature, culture and events, which has made it renowned over the years. The island is one of the most famous destinations for international tourism. It measures 10 square km, 4 km in the municipality of Capri and 6 km in the municipality of Anacapri. Easily and quickly reachable by sea from Naples and the Sorrentine Coast, the island is a gateway to beautiful scenery and a cordial atmosphere. 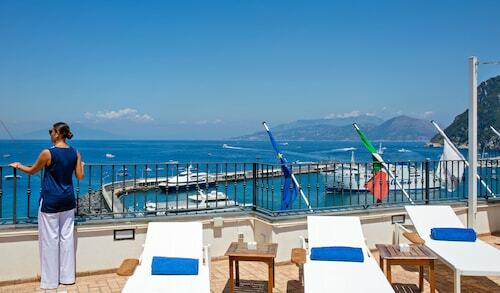 Nestled on the beach, this Capri hotel is within 1 mi (2 km) of Marina Piccola, Piazzetta Capri and Marina Grande. Villa San Michele and Gulf of Naples are also within 3 miles (5 km). 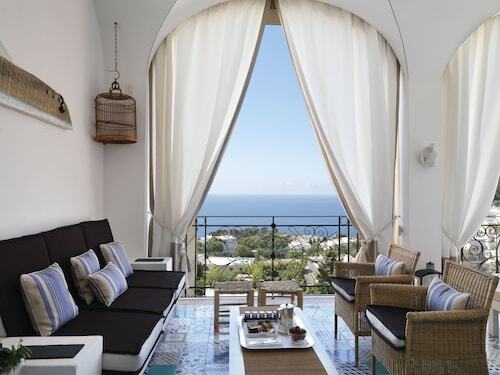 Situated in Capri, this hotel is within a 10-minute walk of Museum Ignazio Cerio and Piazzetta Capri. Marina Grande and Villa San Michele are also within 2 miles (3 km). Located in Capri, this beachfront hotel is on the boardwalk and within a 15-minute walk of Marina Grande and Gulf of Naples. 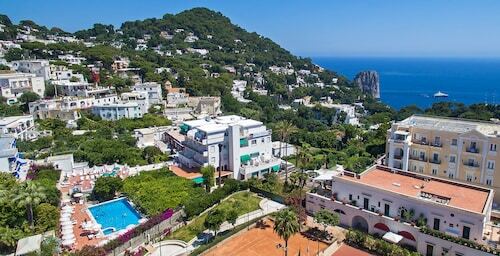 Piazzetta Capri and Villa San Michele are also within 1 mile (2 km). 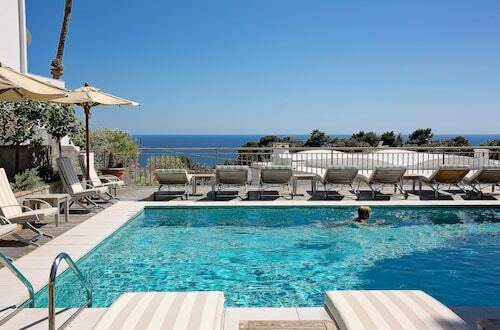 Located in the heart of Capri, this hotel is within 1 mile (2 km) of Museum Ignazio Cerio, Piazzetta Capri and Marina Grande. Villa San Michele and Gulf of Naples are also within 2 miles (3 km). Located in the heart of Capri, this romantic hotel is within 1 mile (2 km) of Marina Piccola, Piazzetta Capri and Marina Grande. Villa San Michele and Gulf of Naples are also within 2 miles (3 km). 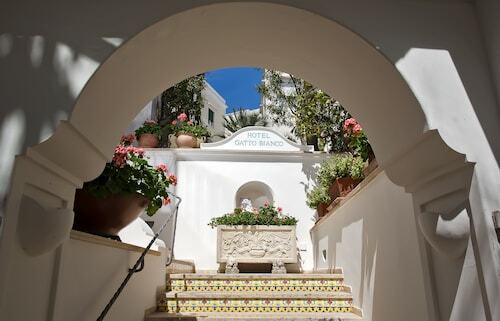 Located in the heart of Capri, this hotel is within a 10-minute walk of Museum Ignazio Cerio and Piazzetta Capri. Marina Grande and Villa San Michele are also within 2 miles (3 km). 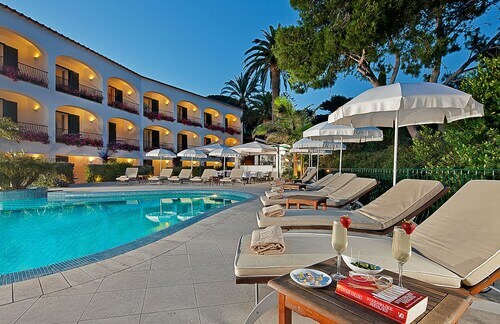 Situated in Capri, this luxury hotel is within 1 mile (2 km) of Museum Ignazio Cerio, Piazzetta Capri and Marina Grande. Villa San Michele and Gulf of Naples are also within 2 miles (3 km).